We would be most interested in employment support for Aspergers employees, such as best practices for placement, behavior management on the job, workplace accommodations, coping skills on the job, how to develop a mentoring relationship with co-workers ...basically how to place and maintain employment. For an individual with Aspergers (high-functioning autism), finding (and keeping) employment can be a very difficult endeavor. It all depends on how well an individual is prepared for his field of interest. Choosing a career that focuses on an individual's special, or limited, interest will raise the chances of successful employment. 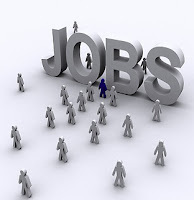 Jobs that have a set daily routine are also good options. Apprenticeship- Specialized careers can be learned this way. Although, not as common as other options, finding a position as an apprentice will get you intense training in all aspects of a trade or career. College- More individuals with Aspergers are attending college than ever before. Some stay home and attend a community college, while others go away to four-year institutions. Job training- Some companies will train an individual who is knowledgeable, yet inexperienced. Technical school- These local schools offer short courses that yield a certificate, and sometimes a diploma, in certain technical skills. Examples are computer fields and auto mechanics. Since individuals with Aspergers are usually extremely intelligent, most of the problems lie within the social aspects of employment. Social communication, understanding body language and other unspoken social cues are necessary in the workplace. Time management and organizational skills are also essential. Behavioral therapy- This therapy is performed under the guidance of a trained behavioral therapist, and includes anger management and general coping skills. Organizational skills- Learning to use visual schedules and lists, calendars, as well as learning time management skills comes about when organizational skills are practiced. Social skills- All areas including, personal space, gestures and cues, facial expressions, and social communication, should be practiced. Social skills classes provide directed practice under the watchful eye of a trained therapist. Once an individual with Aspergers finds employment, he must continue to practice these therapies in order to ensure continued success in his field of interest. Developing a daily routine that incorporates a daily schedule, social skills reminders, and rules to work by will provide the basics for continued employment. I need to find someone to evaluate my daughter for Aspergers. She is 5 and 3/4. Previous evaluations have missed the issues that I am concerned about so I only want to bring her to someone who has Asperger's expertise. Could you direct me to someone who can do this in Westchester County, NY? My child is 15 and I feel there are times when I will be advocating for him when he should be doing it for himself. Any advise where to draw the line? As moms and dads, we sometimes struggle when our kids reach the age of emerging independence. We must begin to let go a little and allow them to be self sufficient in their early teens in order to grow and develop into self-supporting adults. In addition, teenagers with Aspergers (high-functioning autism) can often feel intimidated, automatically stepping aside and allowing a parent or trusted adult to make important decisions, even when they are completely capable. 1. Your son should participate in counseling and group therapy to help keep himself focused. Counseling sessions are useful for people with Aspergers. This is a place where your child can talk about how his strengths and weaknesses make him feel. In group therapy, your son can learn new strategies for coping with social situations. 2. Your son should become active in his IEP process and know his written goals. Your child should be encouraged to take part in his IEP meetings. Once your son acknowledges his own strengths and weaknesses, his input can help the team set reachable goals. 3. Your son must recognize his weaknesses. Just as with his strengths, your child must also be mindful of his weaknesses. People with Aspergers sometimes struggle with language based academics, for example. Social skills and sensory problems may be weak areas for your child. 4. Your son must know his strengths. People with Aspergers are often gifted with an above average I.Q. It is possible that your child excels in one or more academic subjects. People with Aspergers also usually have an intense interest outside of academics, such as music or computers. Knowing his own strengths will help your child gain much needed self-confidence. Aspergers is nothing of which to be ashamed. Aspergers is a part of who your child is but it does not define him. Once your son realizes this, and that he is capable and intelligent, he should be able to step up and take on some of the responsibility of self-advocacy. In the meantime, remember, your child is still a youngster. Make the switch slowly by pushing gently. And foremost, your son still needs you. I have an 16-year-old child with Aspergers. He is an excellent student now that he is doing his high school online through a public charter school. However, he has no concept of time so he is often cramming at the last minute to finish his assignments. How can I help him learn to manage his time better so that he can do his work without added stress and anxiety? 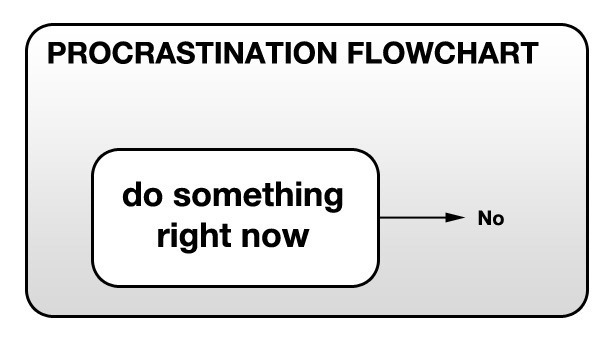 Nothing creates stress and anxiety quite like procrastination. While some individuals are just natural procrastinators, others, like your child, have a genuine problem understanding the concept of time. This is a common characteristic of Aspergers and High-Functioning Autism. Online schooling is a great option for teenagers with Aspergers. Removing the classroom distraction does wonders for your child's thought processes. The lessening of sensory assault, the one-on-one instruction, and no bullies are definite pluses! As an added thought, please consider social skills group classes and other social outlets to prevent total isolation. Clubs and community groups that are geared towards his special interests (i.e., history book club, chess club, and band lessons are common choices) will provide much needed social skills practice in a comfortable environment. Organization is another weak area for many children with Aspergers. Since children with Aspergers are prone to struggle with depression, anxiety, and stress, the addition of poor organization can cause real problems. Organizational skills are necessary for young adults. High school teachers and college professors expect students to contribute acceptable work in a timely manner. Finding solutions that work now will lead to positive changes and less stress in the future. • Visual timers can be very helpful tools when organizational skills are being taught. These timers have a colored line that gets smaller as the time passes, giving the user a true visual image of running out of time. Each daily task or, in your child's case, each school subject, can be timed with the visual timer. Congratulations on finding the solution for your child's school issues. High school can be very overwhelming for teenagers with Aspergers. With your guidance and a plan of organization, your child is sure to finish high school and move on to adulthood ventures with confidence and control. • Visual schedules are a necessary part of your child's routine. Use lists and reminders to keep him moving along. Encourage him to keep a daily, weekly, and monthly calendar. To do lists, written schedules, and assignment lists will give him the structure he needs to begin organizing his life. • Designing an ordered workspace is a good place to start. A designated place for everything, comfortable seating, quiet surroundings, and a calming decor will help diminish distractions. • Creating a routine is essential for your child. As an individual with Aspergers, he craves routine and order. A daily routine will set him on the right path. He may need guidance to develop a routine. Work with him to create a smooth flow to his day. What do you do if your 9 year old with Asperger's is refusing to go to school ever again? Do take her kicking and screaming? Many symptoms, particularly physical complaints, can mimic other disorders. When these occur in combination with a pattern of not attending school, a complete evaluation should be made by qualified professionals to determine whether a student has school refusal disorder or another psychological or possibly even a physical disorder. Separation Anxiety Disorder can be exhausting and frustrating for the moms and dads to deal with, but it is worse for the Aspergers youngster who feels such intense fear and discomfort about going to school. If moms and dads are unable to get the youngster to school, the youngster may develop serious educational, emotional, and social problems. Because the anxiety is about separating from the parent (or attachment object), once the youngster or teen gets to school, they usually calm down and are OK. It's getting them there that is the real challenge. School avoidance or school refusal may serve different functions in different kids or teenagers. For some Aspergers kids or teens, it may be the avoidance of specific fears or phobias triggered in the school setting (e.g., fear of school bathrooms due to contamination fears associated with Obsessive-Compulsive Disorder, fear of test-taking). For other kids or teenagers, it may serve to help them avoid or escape negative social situations (e.g., being bullied by peers, being teased , or having a very critical teacher). When school refusal is anxiety-related, allowing the Aspergers youngster to stay home only worsens the symptoms over time, and getting the youngster back into school as quickly as possible is one of the factors that is associated with more positive outcomes. To do that, however, requires a multimodal approach that involves the student's physician, a mental health professional, the moms and dads, the student, and the school team. The same therapeutic modalities that are effective with Panic Disorder and Obsessive-Compulsive Disorder are also effective for school refusal, namely, exposure-response prevention (a form of cognitive-behavior therapy that may include relaxation training, cognitive alterations, and a graded hierarchy of steps towards the goal). There is some research that suggests that education support therapy may be as effective as exposure therapy for treating school refusal. Working with the school psychologist, the student talks about their fears and is educated in the differences between fear, anxiety, and phobias. They learn to recognize the physical symptoms that are associated with each of these states and are given information to help them overcome their fears about attending school. The student is usually asked to keep a daily diary where they record their fears, thoughts (cognitions), strategies, and feelings about going to school. The time of day that they arrived at school is also recorded, and the record is reviewed each morning with the school psychologist. Although it might seem like a good idea to incorporate positive reinforcement for school attendance, that may backfire and merely increase the student's stress levels and anxiety. Parent training in strategies to work with the Aspergers youngster in the home is also an important piece of any school-based plan to deal with the student with school refusal. • A youngster's reluctance to go to school can be irritating to moms and dads. Expressing resentment and anger is counterproductive. And you won't feel the urge to do so if you adopt specific strategies to assist your Aspergers youngster. • Be open to hearing about how your youngster feels. However, lengthy discussions about the youngster's problems are not always helpful and can be experienced as a burden by the youngster. The focus must always be that you want to help your youngster be free of worries and fears. • Do not deny the youngster's anxiety or worries, but acknowledge them and reassure him/her. For example: "I know you're worried I won't be there to pick you up, but there's no reason to worry. I'll be there." • Do not quiz the Aspergers youngster about why s/he feels scared. The youngster often does not know why. By not being able to provide an explanation, in addition to being anxious, the youngster feels guilty about not making sense of what is happening. Better to acknowledge that the fears make no sense and that the Aspergers youngster has to fight them. • It is most important to tell the Aspergers youngster exactly what s/he is to expect. There should be no "tricks" or surprises. For example, a youngster may be told that he should try to stay in school for only one hour, but after the hour he is encouraged or asked to stay longer either by the school or parent. This will backfire. The youngster will eventually refuse future arrangements for fear that they will be modified arbitrarily. Part of being anxious is anxiety about the unknown and the “what if?”. • Punishment does not work, but kind, consistent, rational pressure and encouragement do. • Try to find ways to enable the Aspergers youngster to go to school. For example, a youngster is likely to feel reassured if times are set for him or her to call the mother from school. In extreme cases, mothers may stay with the youngster in school, but for a specified length of time which is gradually reduced. • Anonymous said… Food plays a huge part in upsetting my son and not wanting to go in he is only six of friends run off and don't wait for him to go in for lunch he doesn't go in and it's gone un noticed by dinner ladies ! !thats a long time to go without food:( breaks my heart ,if I brought him home for lunch I wouldn't get him back in and he struggles with being different and standing out !difficult situation!! • Anonymous said… I had no choice, she wasn't kicking and screaming but her mental health wasn't right, we were abroad, since then I've worked with children and have a better understanding of myself and others with autism. We used to have units attached to schools (Weymouth had one) they were brilliant with good teachers and teaching assistants and environmental was geared to needs. That's what we need, we need to be allowed to decide main stream isn't always the way. • Anonymous said… I had this problem with my son, who has HFA, a couple of years ago. In the end I had to make the decision to keep him home, untill a meetting was set up with school and health care professionals, to decide how to proceed for his best interests. The reason being, he has autism related food refusal, and during the time he was do distressed about going to school, his food refusal got so bad that he started losing weight and became iron deficient. It took 2 years to finally get him settled and happy at school. • Anonymous said… I spent nearly EVERY day of my sin's first grade year with him refusing to go to school. The school told me he'd have to go to "truancy school", with kids from junior high! I completely freaked out and fought back, but basically we just struggled through the miserable year. Second grade was better--his teacher was AMAZING! Made all the difference. • Anonymous said… In my experience, you can only take them 'kicking and screaming' for so long before it takes its toll on the physical and emotional health of everyone involved. It might be helpful to keep in mind that behavior IS communication. Even for kids with this school refusal disorder, they aren't doing this just to make our lives miserable. Sometimes the school setting or routine just doesn't work for every child. Thankfully there are plenty of alternative schooling options these days! • Anonymous said… My sons school is great with the food issue. They always make sure he has something for lunch that he will eat. The problem was, he didn't transition very well from daycare to school, (I live in Sweden). When he first started he was fine. But three months in, he could no longer hold it together and the big change took it's toll, and he almost stopped eating all together, and ended up on specially prescribed drinks. • Anonymous said… No. Don't take her kicking and screaming. Find out why the child doesn't want to go. Wish I had done this with my older son back about 15 yrs. ago. Now I homeschool my youngest. Something I really wished I had done with my middle son. • Anonymous said… There can be all kinds of reasons why children on the spectrum suffer at school, from communication problems (and that covers everything from feeling bullied to not having a clue what is happening in class or what is required of them) to sensory overload. The drip drip of fear, anxiety and confusion may not even come out in meltdowns at school. Schools frequently refuse to understand or make even the simplist of accomodations. Forcing human beings into a situation detrimental to their mental health and ruining educational opportunities is abuse. It's power play on the adult side to never listen and accept childrens feelings. • Anonymous said… There isn't enough xaxax in this world for me to try homeschooling. • Anonymous said… there's no one fit fix for all. Know your child, hear your child and love your child and you'll know what the kick n scream is about. • Anonymous said… Unless the child is being abused, "why" they have problems in school is irrelevant. They are engaged in a power play with you. Do not let them win. Take it from someone on the spectrum who has taught and worked with autistics for years. • Anonymous said… We had this with Aspergers son. We insisted he go. We regretted that when he had a big meltdown at school and an altercation with teachers. He must have had a reason for the refusal. • Anonymous said… Also the school being proactive and setting up these meetings yourself really helps because alot of times things will go faster and smoother with us really involved, I kinda am learning as I go. • Anonymous said… Homeschool. Works for us. • Anonymous said… If you can, you change your life and take them out of school. • Anonymous said… In second grade my daughter begs to not have to go. She quit sleeping at night, vomited in the morning, cried getting out of the car at school. Teacher said all is fine. She got back in the car in the afternoon, started crying, vomited all the way home and has massive meltdowns until bedtime and then the cycle started over. She was fine in school according to the school. At six weeks in I pulled her to homeschool. She was evaluated with a high IQ, Aspergers, anxiety and depression. It's been three years and life is much better for her. She is coping successfully educationally, emotionally and with her anxiety. • Anonymous said… Is there a reason why the child is refusing? is child being bullied? Is child failing classes? Do you have a school that has a special ed department with small classes? i have a current 7th grader in public school. K-5 he was in regular classes. since 6st grade he has been in a special day class with minimal students. His teachers have taught special ed for years and work very well with him and the other students in the class. We are currently working on getting placement for high school as the public high schools do not seem to have small classes for our sensitive kids. We are mainly looking at charters/magnets that have special ed departments with small classes. While my son attended regular classes in elementary, we tried last year to put him into a regular class for two hours and it was a nightmare. He developed bad ocd which led us to medicate him...a HUGE mistake for us as it made him violent. • Anonymous said… My daughter is 9 and ad the yrs went on it got harder and nearly impossible to get her to school. I had to resort to homeschooling to stabilize the situation get her evaluated, take a break and get proper personalised tools in place to help her feel comfortable going to school. The school referred an aid from a program that would come an hour before school and go with her to school and stay for 2 more hours with her. That helped her atleast try school again but she still was off and on about school. Then we got an IEP and she has daily access to the special education room even though she's super smart. Ever since she has been able to go to the special education room she has been going to school since it's been about a week but she's doing good and that may be the key for her to be calm and go. • Anonymous said… My oldest is 14 and we have a 11 yr old too. They both refused to go to school and disliked it. I literally have took them both, carried them, crying and screaming. I had enough. How can they be learning? We have homeschooled for 4 years. Things are so much better. Not worth their anxiety and stress for my "quiet" time. • Anonymous said… My son is high functioning autistic.. The beginning of the school year was super rough...The first couple of weeks we had to drive him and take him in kicking and screaming (transitioning is not our strong point) but once he got used to going back he was fine.. Hes in 5th grade we have an IEP in place he eats lunch in the office and if hes having a rough morning he goes into the Deans office and hangs out with him. • Anonymous said… Not if you want to maintain a trusting relationship with your child. They aren't mucking up. It seems that this is pretty classic for our special kids (including mine). The school refusal is a cry for help and letting you know the current situation isn't working. Dragging her kicking and screaming will just traumatise her further and fracture the trust she has in your relationship with her. From my perspective no education is worth that. See if you can find another option for her that suits her needs better. • Anonymous said… Same issue here but a long time ago now. Oliver didn't see why he had to go to school but I pointed out it was the law and if he didn't go to school I would have to go to prison. He accepted this and went to school because he didn't want me to go to prison. Of course it depends on your relationship. I know some children who would see this as a bonus. He did continue to argue the point on a regular basis but I would remind him that it was the 'rule'. • Anonymous said… Same with mine but we had to support this by discussion during periods of calm. This included the odd occasion when we 'agreed' to his having a day off from school BUT he would have to go along with my plans for the day including stuff like shopping (which he hated). Oliver knew I had to go to work to pay for his food and computer stuff etc and essentially learned to rationalise his own thinking to accept the status quo. He continued to hate school but accepted the rules. • Anonymous said… She was homeschooled for about 7 months this school yr during the whole process. She has asbergers, anxiety and adult defiant disorder. • Anonymous said… This works for some kids and worked with mine for a little while. My sons anxiety was too high to be able to make rational decisions once he was in a heightened state. • Anonymous said… You really have to be their advocate. So many untrained individuals that don't really understand our kids. Believe your kids more. My daughter is now in her twenties and out of frustrations of not knowing how to handle the spectrum as a whole a lot of abuse takes place. Which of course comes in many forms so can be very discouraging for our kids. Over the years some were caught and fired. It's really about having a heart to want to work with them with proper training. Stay strong and love and encourage them. They need us. Do you have rating scale or checklist about interpersonal behavior for Aspergers children? Thank you so much for your attention. Many Aspergers kid’s social problems are not recognized until they enter preschool. The first things noticed may be a tendency to avoid spontaneous social interactions, to have problems maintaining a conversation and to have a tendency to repeat phrases and make odd statements. They may not make many friends and often have difficulty keeping them. Emotional responses such anger, aggression, or anxiety may be excessive or inappropriate to the situation. Aspergers kids also prefer a set routine to frequent changes in the environment. 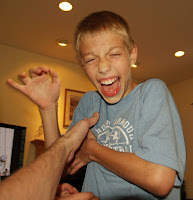 Because of their social ineptness Aspergers kids are often the focus of bullying, scape-goating, hazing and teasing. This often leads to anxiety, feelings of rejection, depression and withdrawal. Adolescence may bring on crises for Aspergers kids because the very social skills they lack are central to adolescent social developmental. Successful adolescents have sensitivities to social nuances and variations in language that nerds lack. For some teenagers, computers are an alternative from stressful social situations. Computers also provide a more linear, modulated form of socialization that Aspergers kids are more skilled and comfortable at handling. Since many Aspergers kids become very computer proficient, they become valuable resources to their peers. It also provides a media for social interaction in which they can feel competent and valued. Aspergers adults can lead a normal life. They tend to pursue vocations that relate to their special interests, sometimes with great success, as with Einstein and Newton. Some are able to complete college and even graduate school. However, most will continue to show subtle differences in social style. The social and emotional demands of marriage can be demanding for them. • Introduce to teacher, therapist or para-professional before work begins. • Take tour of building youngster will be working or learning in. (1) Try to figure out what your youngster is communicating with the challenging behavior. (2) Consider how you can adapt the situation. • Youngster overwhelmed or overstimulated? Try reducing amount of time in situation, or avoiding it in future. (3) If the message must be communicated, come up with alternate way in which your youngster can communicate his or her needs or wishes more appropriately. (4) Practice the “new way” of communicating. (5) Reward your youngster for using the strategy by showing that it gets his or her needs met. (6) Be sure that the challenging behavior is no longer effective in getting your youngster's needs met. • if youngster screams to avoid situation, prompt her to use an appropriate phrase. Do NOT allow her to leave the situation while she is screaming. My 5 year old was just diagnosed with aspergers. Where do I start to help him and where do I start to educate myself? I feel alone and scared. I live in a small area and I don't even know if we have anyone here that is well educated to guide us. How do I find that out? A great place to start is with The Aspergers Comprehensive Handbook: Help for Parents with Aspergers Children. Aspergers (high functioning autism) is a developmental disorder falling within the autistic spectrum affecting two-way social interaction, verbal and nonverbal communication and a reluctance to accept change, inflexibility of thought and to have all absorbing narrow areas of interest. Individuals are usually extremely good on rote memory skills (facts, figures, dates, times etc.) many excel in math and science. There is a range of severity of symptoms within the syndrome, the very mildly affected youngster often goes undiagnosed and may just appear odd or eccentric. While Aspergers is much more common than Autism it is still a rare condition and few people, including professionals, will know about it much less have experience of it. It seems to affect more boys than girls. In general terms they find making friends difficult, not understanding the subtle clues needed to do so. They often use language in a slightly odd way and take literal meanings from what is read or heard. They are happiest with routines and a structured environment, finding it difficult to decide what to do they fall back on to their preferred activities. They love praise, winning and being first, but find loosing, imperfection and criticism very difficult to take. Bad behavior often stems from an inability to communicate their frustrations and anxieties. They need love, tenderness, care, patience and understanding. Within this framework they seem to flourish. As the kids mature some problems will get easier, but like all other kids new problems will emerge. Some teenagers can feel the lack of friendships difficult to cope with as they try hard to make friends in their own way but find it hard to keep them. This is not always the case, many have friends who act as 'buddies' for long periods of time. Social skills will have to be taught in an effort for them to find a place in the world ... so take all opportunities to explain situations time and time again ..... and one day.......it may work! The debate on this question still continues, some experts say that Aspergers should be classified separately, others argue that the core difficulties are the same, only the degree to which they are seen in the kids actually makes the difference. One expert - Uta Frith - has referred to Aspergers kids as 'Having a dash of Autism'. For the moment it is taken that the similarities are enough for both Autism and Aspergers to be considered within the same 'spectrum' of developmental disorders. Whilst a clear diagnosis is essential, it can change through life. The autistic traits seen in young kids can often seem less severe as the youngster matures and learns strategies to cope with his/her difficulties. Kids often impose rigid routine on themselves and those around them, from how they want things done, to what they will eat etc. It can be very frustrating for all concerned. Routines will change from time to time, as they mature they are perhaps a little easier to reason with. This inflexibility shows itself in other ways too, giving rise to difficulties with imaginative and creative thinking. The youngster tends to like the same old thing done in the same old way over and over again!. They often can't see the point of a story or the connection between starting a task and what will be the result. They usually excel at rote memory - learning information without understanding, but it can still be an asset. Attempts should always be made to explain everything in a way they can understand. Don't assume because they parrot information back that they know what they are talking about. If the youngster with Aspergers is to be educated in a mainstream school it is important that the correct amount of support is made available. In order to get the correct support a Statement of Special Educational Needs should be drawn up from the various advice supplied by you and the specialists. This procedure, when it begins, can take 6 months and be a very stressful and confusing time - don't be afraid to contact people who can help, this need not be a professional it may just be someone who has done it all before. The home/school link is vital, a diary can prove invaluable giving two way communication on achievements and problems on a regular basis. Parenting your youngster with symptoms of Aspergers can be a daunting task. You may have just discovered that your youngster has a diagnosis of AS and you are thinking “What now?” Or you may have a youngster who you know is different and/or a health professional has said that he or she has some attributes of Aspergers or Mild Aspergers but is still considered in the normal range. You are probably feeling a little overwhelmed and it might seem like you are the only person or family going through these issues. We know because that’s exactly how we felt. Like you, we are moms and dads who would like nothing more than for all of our kids to reach their maximum potential. Because they only match some of the assessment criteria needed for an Aspergers diagnosis, we have had to find help for our kids ourselves. And we have found this help in some of the most unexpected places. This makes us uniquely positioned to show you how to get help from a variety of sources for your “normal” youngster or kids. I wonder, do your youngster’s specific behavioral problems seem worse after lunch or a party? He or she may be intolerant to certain types of food. We can give you information about food intolerances and share with you our expertise of what we have learned. While there is not much scientific evidence that foods affect AS, we can show you information that you may want to look into. Have you noticed that your youngster doesn’t like loud noises, bright lights, tight or loose fitting clothes and reacts inappropriately to any of these particular things? Does your youngster crave fast movement or are they almost impossible to get moving in the morning? The good news is there is an answer. They may have Sensory Integration Disorder (SID). There is growing evidence that links SID and Aspergers. Sensory Integration Disorder is easily manageable with techniques you can learn and do at home. Do you find routines hard to establish and maintain? Using Visual Aids for your Aspergers youngster might just benefit you and your youngster as it has benefited us. All this might seem a little daunting at the moment. However, with experience and help, including ours, you can teach your youngster to rule their Aspergers rather than have their Aspergers rule them. On the pages of this site, you will find reference to many useful books and resources that help us and our kids cope with life. The books include those on AS as well as Sensory Integration and Food intolerances. You will also find information and links to other sites that provide information on other disorders related to Aspergers. Begin early to teach the difference between private and public places and actions, so that they can develop ways of coping with more complex social rules later in life. Don't always expect them to 'act their age' they are usually immature and you should make some allowances for this. Explain why they should look at you when you speak to them.... encourage them, give lots of praise for any achievement - especially when they use a social skill without prompting. Find a way of coping with behavior problems - perhaps trying to ignore it if it's not too bad or hugging sometimes can help. In some young kids who appear not to listen - the act of 'singing' your words can have a beneficial effect. Keep all your speech simple - to a level they understand. Keep instructions simple ... for complicated jobs use lists or pictures. Let them know that you love them - wart's an' all' - and that you are proud of them. It can be very easy with a youngster who rarely speaks not to tell them all the things you feel inside. Limit their 'special interest' time to set amounts of time each day if you can. Pre-warn them of any changes, and give warning prompts if you want them to finish a task... 'when you have colored that in we are going shopping'. Promises and threats you make will have to be kept - so try not to make them too lightly. Teach them some strategies for coping - telling people who are teasing perhaps to 'go away' or to breathe deeply and count to 20 if they feel the urge to cry in public. Try to build in some flexibility in their routine, if they learn early that things do change and often without warning - it can help. Try to get confirmation that they understand what you are talking about/or asking - don't rely on a stock yes or no - that they like to answer with. Try to identify stress triggers - avoid them if possible -be ready to distract with some alternative 'come and see this...' etc. Use turn taking activities as much as possible, not only in games but at home too. Children with Aspergers are unique, and they can affect the learning environment in both positive and negative ways. In the classroom, the Aspergers child can present a challenge for the most experienced teacher. These children can also contribute a lot to the classroom because they can be extremely creative and see things and execute various tasks in different ways. Teachers can learn a lot when they have a child with Aspergers in their class, but the teacher may experience some very challenging days too. Aspergers children and showing work: Many teachers require children to "show their work"; in other words, illustrate how they got the answer to a problem. "Showing work" is a demand that usually accompanies math homework. This may not be the best strategy with the Aspergers child, and may in fact lead to a big disagreement with the child. Since many Aspergers children are visual learners, they picture how to solve the problem in their heads. To make them write out how they got they answer seems quite illogical to them. Why would you waste your time writing out something you can see in your head? The requirement of "showing work" simply does not make any sense to them, and it may not be worth the time it would take to convince them to do the requirement anyway. Aspergers children frequently are visual learners. Despite difficulties with eye contact, many Aspergers children are visual learners. Much of the information presented in classrooms is oral, and often children with Aspergers may have difficulty with processing language. Often they cannot take in oral language quickly, and presenting information visually may be more helpful. Many Aspergers children are "hands-on" learners. Avoid demanding the child with Aspergers maintain eye contact with you. Eye contact is a form of communication in American culture; we assume a person is giving us their attention if they look at us. 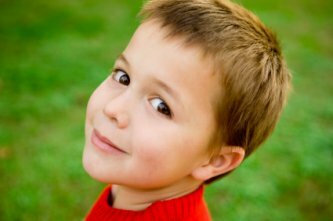 The Aspergers child experiences difficulty with eye contact; it is extremely hard for them to focus their eyes on a person for any extended period of time. Limited eye contact is a part of the disability. Don't demand an Aspergers child look you in the eye as you are talking to them--this is extremely difficult for them to do. Don't assume the child with Aspergers is disrupting class or misbehaving to get attention. More often than not, children with Aspergers react to their environment, and sometimes the reaction can be negative. Sometimes the child may be reacting to a sensory issue, and other times the child may be reacting to a feeling of fear. The Aspergers child feels fear because of a lack of control over his/her response to the environment or because of a lack of predictability. The child with Aspergers does best with clear structure and routine. A visual schedule can be helpful for the child. Every youngster with Aspergers is different. As a teacher you want to take the information you have acquired and apply it, but every Aspergers child is different, so it's difficult to take knowledge you have gained from one experience, and apply it to a situation with another child with Aspergers. Remember that each youngster with Aspergers is unique, and strategies that have worked with other children in the past may not work effectively with the Aspergers child because they perceive the world in a unique way, and they sometimes react to their environment in unpredictable ways. If the child with Aspergers is staring off into space or doodling, don't assume they're not listening. Remember the Aspergers child may experience difficulty with communication, especially nonverbal communication. What appears to the teacher to be behavior illustrating a lack of attention on the part of the child may not be that at all. In fact, the Aspergers child who is doodling or staring off may actually be trying to focus him or herself through the act of doodling or staring. The child is unaware that nonverbally s/he is communicating to the teacher that "I'm not listening, or I'm bored." Doodling or staring may actually help the child with Aspergers focus more on what the teacher is presenting. You might simply ask the child a question to check if he or she is listening. Sensory issues affect learning for the child with Aspergers. Often Aspergers children are distracted by something in the environment that they simply cannot control. To them, the ticking of the clock can seem like the beating of a drum, the breeze from an open window can feel like a tremendous gust, the smell of food from the cafeteria can overpower them and make them feel sick, the bright sunshine pouring through the windows may be almost blinding to them. This sensory overload the Aspergers child experiences may overwhelm them, so focusing can be difficult and frustration occurs. Frustration can then lead to disruptions from the child. To cope with frustration the child might choose to repeatedly tap a pencil on a desk (or another disruptive behavior) to focus themselves because s/he is experiencing sensory overload. What appears disruptive to the teacher and the rest of the class may actually be a way for the Aspergers child to cope with the sensory overload. Obviously, a teacher does not want disruptions in the classroom. Take time to evaluate the classroom in terms of sensory stimulation, and how the environment affects the child with Aspergers. Perhaps some modifications can be made, or the child can be taught some coping skills that are not disruptive to classmates, like squeezing a squishy ball in their hand or some similar activity. Children with Aspergers experience difficulty with transitions. Often a child with Aspergers gets "stuck" and has difficulty moving from one activity to another. They may need to be coached through the transition, and if a typical school day is loaded with lots of transitions, the child faces increased anxiety. Moving from one activity to another is not a challenge for most children, but for the child with Aspergers transitions can be monumental tasks. Some possible strategies a teacher, paraprofessional, or parent can use: visual schedules, role-playing or preparing the child by discussing upcoming activities. Appropriate strategies are dependent on the age of the child and his/her abilities. Children with Aspergers may experience difficulties with focusing as well as lack of focus. Focus involves attention. Sometimes Aspergers children focus all their attention on a particular object or subject; therefore, they fail to focus on what information the instructor is presenting. All their energy is directed toward a particular subject or object. Why? Because that object or subject is not overwhelming to them and they understand it. To overcome this problem, the teacher can try to establish some connection between the object or subject of interest and the area of study. For example, if a child is fascinated with skateboarding, the child could learn reading and writing skills through researching a famous skateboarder and writing a report. Math skills could be taught by looking at the statistics involving competitive skateboarders. The possibilities for instruction are endless, but it will take some time and creative planning on the part of the teacher. As a teacher, paraprofessional or parent of a youngster with Aspergers, it's important to recognize the youngster's gifts as well as limitations. Children with Aspergers present a challenge for the people who work with them, but these kids also enrich our lives. So when you're feeling frazzled, take a deep breath and remember that tomorrow is another day. This youngster will grow up and make a contribution to our world in some way we can only imagine, and you can help this youngster.